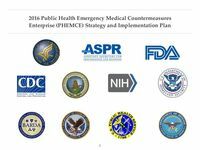 Time Magazine named the Hemopurifier® a "Top 25 Invention" and a "Remarkable Advance in Healthcare" based on its use in treating Ebola virus. 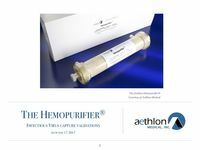 Aethlon Medical is advancing the Hemopurifier® to fulfill strategic objectives set forth by the U.S. Government to protect its citizens from the threats of bioterrorism and emerging pandemics. 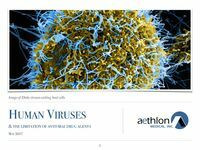 The Hemopurifier® captures infectious viruses by a protective glycan shield that viruses deploy to evade detection by the host immune system. 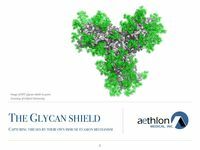 The glycan shield also represents a major impediment to vaccine and antibody drug drug development. The Hemopurifier® has been proven to capture a broad-spectrum of infectious viral pathogens. 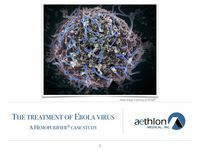 Of the hundreds of viruses that are infectious to humans, only 9 are addressed with an approved antiviral drug agent. 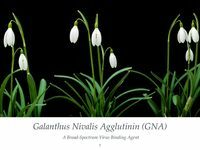 Residing within the Hemopurifier® is galanthus nivalis agglutinin (GNA), which has an affinity to bind infectious viruses by their surface glycan shield.